British racer Liam Doran is well known for his black Monster Energy sponsored Citroen race cars but after a Global RallyCross season opener in Brazil where Doran crashed during both his heat race and the last chance qualifier – Doran has announced that he will spend the rest of the 2013 GRC schedule behind the wheel of a new MINI rallycross car. Liam Doran has long been winning rally and rallycross races around the world behind the wheel of his Citroen C4 or DS3 decked out in sponsor Monster Energy Drink’s black and green scheme including a gold medal at the 2011 X Games but starting at the X Games Barcelona event in mid May – Doran will be piloting a new MINI John Cooper Works RX built by legendary race car builder Prodrive. Prodrive has built all sorts of race cars for other automakers including Subaru, Ford and Aston Martin along with their current work with the Mini World Rally Car team. Prodrive built the Subaru race cars that won World Rally Championships in 1995, 2001 and 2003. Along with the fact that Liam Doran has been racing Citroën rally cars for so long, his move to the Prodrive MINI comes as a surprise due to his early success at the first 2013 Global RallyCross event at X Games Brazil. Doran posted the second fastest time in qualifying last weekend behind only race winner Scott Speed but his Brazilian X Games went south in a hurry when he was taken out by Toomas Heikkinen in the first heat race of the day. That caused Doran to finish last in the heat race, leaving only the Last Chance Qualifier race to help the Monster Energy Citroën DS3 get into the finals. 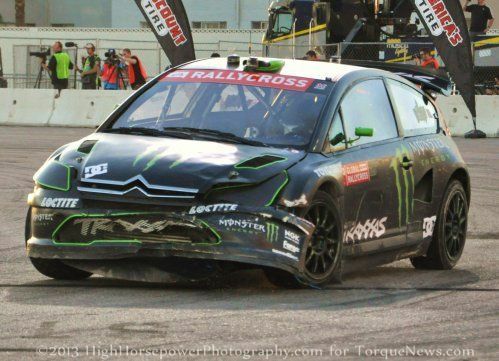 Unfortunately, as the Last Chance race took the green light, Doran had trouble with the launch and Dodge Dart driver Bryce Menzies – who did get a good launch – slammed into the back of Doran’s Citroën. Doran ended up finishing 13th over, just two spots out of last. Liam Doran’s first race in his new his Prodrive MINI John Cooper Works RallyCross car is scheduled for the weekend of May 18th and 19th for the second of four X Games events in 2013. After the launch of the new MINI RallyCross car in Spain, Doran will continue on in the JCW MINI for the rest of the 2013 Global RallyCross schedule including stops in Munich Germany, Loudon New Hampshire, Bristol Tennessee, Atlanta Georgia, Charlotte North Carolina and Los Angeles California – the site of the X Games event that Doran won back in 2011 with his Monster Energy Citroën. Doran competed in four events during the 2012 Global RallyCross season with his best finish coming at the Los Angeles X Games where he placed 5th overall. Doran and his trusty Citroën finished 7th in New Hampshire, 11th in Texas and 14th at the Las Vegas season finale. Doran finished 15th in 2012 season championship standings with 30 points – 64 points behind champ Tanner Foust. With numbers like that, it is no wonder that Doran was happy to jump into a new ride for the 2013 Global RallyCross season. For the Global RallyCross fans, this means one more automaker throwing their hat into the booming racing series. The Brazilian X Games introduced GRC fans to the newest entries from Volkswagen, Mitsubishi and Peugeot joining the Ford, Dodge and Citroën teams from 2012. With Saab and Hyundai pulling out of GRC, the addition of new brands along with the arrival of the new Subaru GRC racers will help the sport grow as loyal fans cheer on their favorite automaker…and more automakers means more fans. 2017 MINI Cooper S Countryman ALL4 Has Arrived; Is Bigger Better?